Grilling season is in full swing and these kabobs were one of the very first things we threw on the grill this summer. They are so, so, SO good. The flavors are summery fresh and they all meld together incredibly well. We’re talking rosemary, garlic and lemon! Amazing! There’s plenty of each of these ingredients in the marinade, so there is no lack of flavor whatsoever. And, if that isn’t convincing enough, the chicken is incredibly moist (so long as you don’t over cook). The base for the marinade is buttermilk and while it provides nice tang, it also makes that chicken nice and juicy! We like to add bell peppers and red onion to our kabobs. There are various opinions on whether you should grill your veggies separate from your meat. The main argument for this is so that you can cook each to the level of doneness you prefer since they rarely get done at the exact same time. I am not picky with the level of doneness on my veggies (I find that they’re slightly still crisp once the chicken is done . . . and I love them like that anyways), so I combine my meat and veggies on the same skewer. Plus, I think it looks prettier. However, if you’re one that likes your veggies cooked to a perfect doneness (per your opinion), then put your meat and veggies on separate skewers. You seriously gotta make these this summer. Probably more than once! Again, they are so, so, SO good! Pepare marinade by combining buttermilk, rosemary, olive oil, minced garlic, lemon zest, lemon juice, salt, and pepper in a small-medium bowl. Whisk to combine. Combine the chicken and marinade in a large zipper-lock bag, press out the air, and seal the bag tightly. Toss to coat the meat and let marinate in the refrigerator for at least 1 hour or up to 6 hours, flipping the bag occasionally. Thread the marinated chicken, peppers, and onion onto 12 skewers in an alternating pattern, then brush with leftover marinade. Prepare grill. IF USING A GAS GRILL: Turn all the burners to high, cover, and heat the grill until hot. Turn all the burners to medium-high. IF USING A CHARCOAL GRILL: Open the bottom grill vents completely. Light a large chimney starter three-quarters full with charcoal briquettes. When the coals are hot, pour them in an even layer over the grill. Set the cooking grate in place, cover, and heat the grill until hot. Clean and oil the cooking grate. 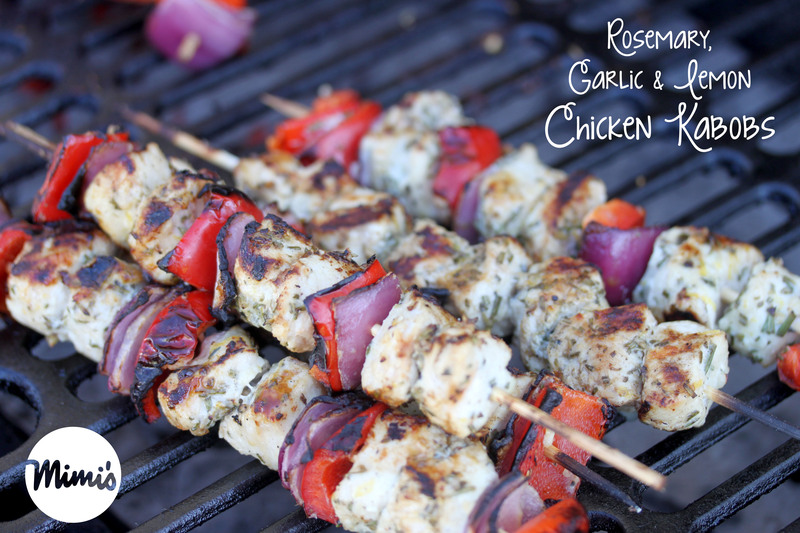 Place the kabobs on the grill and cook, turning as needed, until the chicken and vegetables are lightly charred on all sides and the chicken registers 160 to 165 degrees on an instant-read thermometer (or until juices run clear), 8-12 minutes. Transfer the kabobs to a platter, tent loosely with aluminum foil, and let rest for 5 minutes. Serve with lemon wedges.